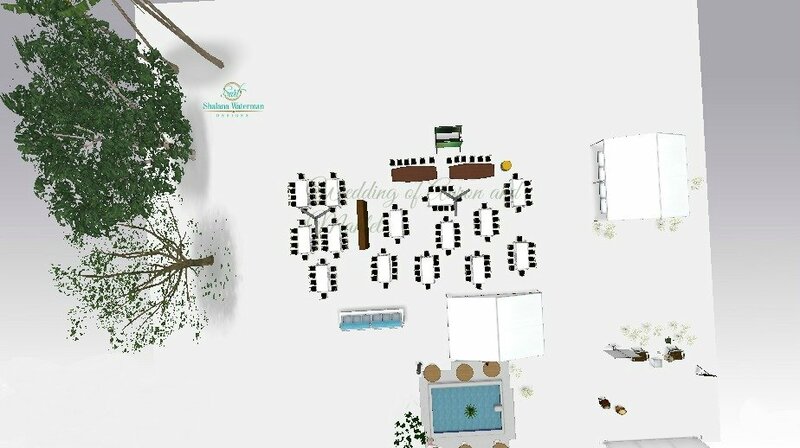 At Shalana Waterman Designs we are resourced with a design team that will not only assist you in choosing the best furniture and design pieces for your wedding or event but will also assist you in designing your space by producing realistic 2D and 3D renderings that are true to color, scale, style and form. We believe this is important as most clients are visual and the ability to see their design allows them to make informed decisions of their chosen schematics and themes. It also makes it much easier to build on the design. We find this most useful for our off site clients and destination couples usually arriving on island a mere week, at most, before their wedding or event. This is also important in displaying to our clients all of the elements being offered to them as part of their overall design. Our aim is to ensure our client's design process is as seamless as possible. After an initial site meeting with our clients, we quickly turn around to provide a realistic 2D or 3D design that allows for the advancing of planning the event. Our design team is part of this process to then bring the designs from rendering to real life.